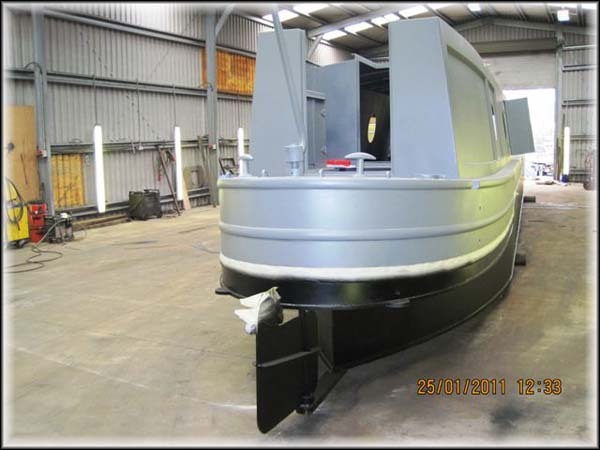 We’ve been able to identify more detail on Waiouru’s stern. The original anchor points (I think the correct term is “dollies”) have now be replaced with the ‘T’ shaped anchor points we specified. Why did we specify this style of anchor point? It seemed to me this design gave an improved grip on the mooring rope. Note the separate cover to the weed hatch. This should reduce the possibility of a loose weed hatch cover accidentally flooding the engine compartment. Oh, and I’ve also noted the two small holes in the corners of the drainage gutter around the engine compartment hatch. This confirms the responses from our blog readers who informed us the holes on the exterior of the shell were likely to be for the drainage of water and gas. 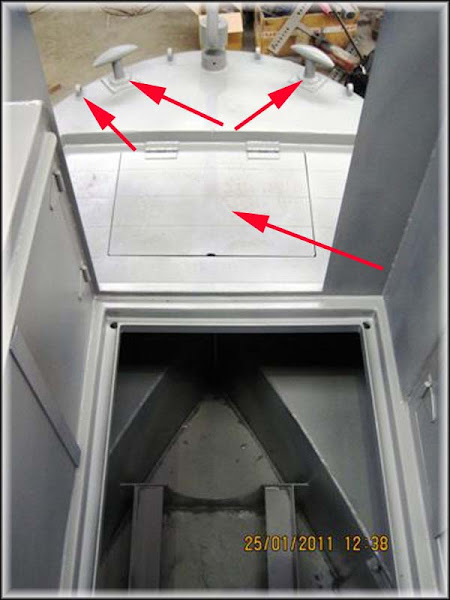 The gas locker will be located in the left locker (starboard) as shown in the photo. The right locker is for general storage. I’ve also noted the four small anchor ‘loops’ on the stern and I’m fairly certain they are used to secure the fender which protrudes from the rear and prevents the rudder being struck.